In delivering exciting housing schemes and developments means we are often nominated for various awards. We've been consistently recognised by the Local Authority Building Control Building Excellence Awards over the last decade, where either our developments or our site staff have been finalists, highly commended or winners in respective categories. 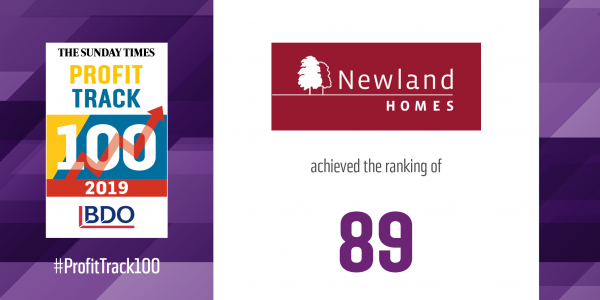 During 2019, to date Newland Homes has achieved listing status in The Sunday Times BDO Profit Track 100 2019, coming in at no 89 of the fastest growing private companies in the UK, and no 6 regionally in the south west. In addition its development at Frome "The Old Nurseries" is a regional finalist in the LABC Building Awards for Excellence, whilst Broad Blunsdon Heights, nr Swindon has won Best New Large Housing Development in the Swindon Borough Council Local Building Excellence Awards 2019. For 2018, we're nominated for Best Housing Developer at Cotswold Edge, Mickleton; Churchill Gardens, Yate; Whitebridge Gardens, Thornbury; and Sandridge Gardens, Melksham. Two of our site managers from these developments are also finalists in the regional category for Best Site Manager. In 2017 and 2016 we also enjoyed similar accolades, which have been consistently achieved over a number of years, most notably in 2009 where we won the Best Large Developer in the West of England Regional Finals. We were narrowly beaten by a major developer at the National Awards held in London. In 2014 we were even awarded the Trowbridge Town Enhancement Award for our redevelopment of the Ushers Bottling Plant, which we also won in 2011 for 'The Ushers Apartments', and again previously for our 'Conigre' development nearby. In 2015, we were also pleased to have been included on the London Stock Exchange Group's list of '1000 SME Companies to Inspire Britain'. Newland Homes continues to strive for excellence and are proud of our achievements.